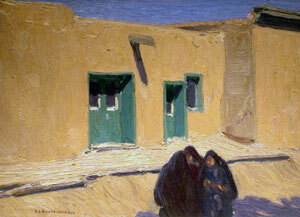 Ernest Blumenschein, Las Tres Mujeres, Oil on Board, 9" x 12"
Ernest L. Blumenschein was far and away the most well known of the Taos painters during his lifetime. His painstakingly executed canvases, in his distinctive style that was first called "post-impressionist" and later modernist, garnered him a wide and appreciative audience, and numerous awards. His paintings today are held by the most important museum collections in the United States. Blumenschein was born in Pittsburgh, Pennsylvania, to parents of German descent, and raised in Dayton, Ohio. His father was a professional musician and composer, who chiefly made his living as a conductor of large choruses. The young Ernest excelled at music from the beginning, and his father had high hopes that he would follow his footsteps and become a professional. When Ernest showed an interest in art, his father only pushed him harder to stay devoted to music, feeling that was where his greatest talent lay. At 17, Blumenschein won a scholarship to study at the Cincinnati College of Music. However, while studying music he also enrolled in classes at the Art Academy. He was soon convinced that his future career was to be that of an artist, and consequently moved to New York City to study painting at the Art Students League. However, he remained a tremendously talented musician, supporting himself by playing first violin in the New York Symphony. The conductor at the time was none other than the world famous Czech composer, Anton Dvorak. Dvorak was apparently so impressed with the youngster that he appointed him first violin immediately after hearing him play a D minor scale. Few people would have given up a music career that was off to such a promising start (to say the least), but Blumenschein had made his decision. 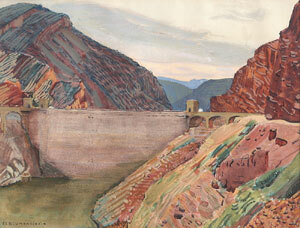 Ernest Blumenschein, Apache Trail Arizona, Watercolor on Paper, Circa 1920, 10" x 12"
At the end of the 19th Century, it was compulsory that an aspiring painter study in Europe. Blumenschein made his first trip in 1892 to study at the Academie Julian in Paris, where he worked at academic figure painting. While in Paris, he met some other future Taos painters: Bert Phillips, E.I. Couse, and most notably, Joseph Henry Sharp. It was Sharp who would inspire the other three with his stories and sketches of Arizona and New Mexico. Blumenschein determined that he would visit the Southwest as soon as the opportunity arose. "No artist had ever recorded the New Mexico I was now seeing. No writer had ever written down the smell of this air or the feel of that morning's sky. I was receiving...the first great unforgettable inspiration of my life." He was 24 years old at the time. The natives that Blumenschein encountered were friendly, and once the wheel was mended he and Phillips took their wagon into town and started to paint. Phillips was as inspired by the surroundings as Blumenschein, and it was he who stayed on. Blumenschein left Taos after three months and went back to Paris for further study. He only stayed a year, and returned to New York to continue his work as an illustrator, but went back to Paris in 1902 for a more protracted stay. 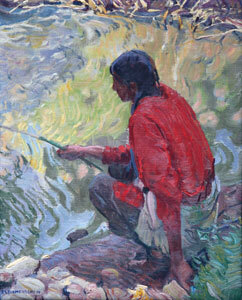 E. L. Blumenschein, Taos Indian Fishing, Oil on Canvas, c. 1920, 20" x 16"
Blumenschein continued his studies in Paris, and also kept working as an illustrator, supporting himself easily. In fact, during this time in Paris, his illustration work was much in demand by American magazines, his commissions mounting every month. He also illustrated several books, including Jack London's first book, "Love of Life," in 1904. This led to his working with other famous writers such as Stephen Crane, Willa Cather, and Joseph Conrad. During this time he also met a painter named Mary Shepard Greene, who was fairly prominent in Paris at the time. She exhibited widely, and had won medals at the Paris salons. Blumenschein and Greene married in 1905, to the consternation of her friends, who thought that a prominent painter should not be marrying an illustrator, and that it would damage Greene's career. In fact, both of their careers went on fine. Even after their move to New York in 1909, Greene continued to exhibit widely in Europe, as well as the United States. Back in New York, the Blumenscheins both taught at the Pratt Institute. Ernest worked tirelessly at his paintings and as an illustrator during the fall and winter, and spent every summer in Taos. Mary would not accompany him on these sojourns, as she was genuinely terrified of the American Indians. Her fears were obviously unfounded, as her husband returned safely from his summer trips, year after year. They remained in New York, and Blumenschein began to have great success exhibiting his paintings. Just a few awards from a very long list are: Silver Medal, Pan Pacific Exposition, 1914; Potter Palmer Gold Medal, Art Institute of Chicago, 1917; Steinway Collection, commission for a painting based on MacDowell's "Indian Suite;" and he was elected as an associate to the National Academy. He was, in fact, garnering accolades almost constantly, something that would continue for the rest of his life. "I can't explain why I paint and draw. It is as necessary for me to do as for an apple tree to produce fruit. Just a job I love. But a good many bad apples came off my tree - and were often destroyed." He would often repaint canvases, sometimes after many years had passed. It should be noted that Blumenschein had another vent, throughout his life, for his enthusiasm and determination: athletics. He had played tennis as a boy, and football in high school. It was while he was in Paris that he began playing tennis seriously, winning several trophies there. He continued in the United States, often traveling to play in tournaments that he frequently won. He was ever the artist though, as he said: "There was never a tennis trip that didn't yield a picture." He would often return to paint landscapes that he had glimpsed while on the road or in another town. Another passion of his was bridge, which he played in tournaments across the country, and which he considered a great discipline in memory. All through the 1920's, Blumenschein continued to win awards for his paintings at an almost alarming rate. A short sample of some of the institutions that honored him were: The Gilcrease Foundation, Oklahoma; Art Director's Show, New York; National Academy of Design, New York; Fort Worth Art Museum, Texas; City of Philadelphia; Brooklyn Museum, New York; National Arts Club; and the Chicago World's Fair. In 1927, he was elected to full membership of the National Academy, which was the highest honor that an American artist could receive at the time. He had gallery representation through Grand Central Art Galleries, in the Grand Central Terminal, New York, and his paintings continued to travel the country. Throughout the following decades, his work would even traverse the globe, as he was invited to exhibit at the Venice Biennial, and in Budapest, Munich, Paris, England, New Zealand and Argentina. Blumenschein remained in Taos for the rest of his life, though at one point he began to spend winters in Albuquerque, where it was not quite as cold. Even when he was eighty years old, he still labored as diligently over his canvases as he ever had. When he died in 1960, he was the most famous resident of Taos, and six years later the Blumenschein home was designated as a National Historic Landmark. Today, Blumenschein's work is held by the most prestigious museums in the country, including the Museum of Modern Art, New York, the Metropolitan, and the Smithsonian Institution. Blumenschein once said that he considered his greatest artistic heroes to be Shakespeare, Michelangelo, El Greco, Beethoven, and Bach. It is fitting that he too became preeminent among artists in his lifetime and has gone down as one of the most important painter's in American history.